The Swing'n Monkey and play deck adds over 32 square feet of deck space to a Congo Swing'n Monkey Playset. Includes a 6 foot long entry ramp with rope guides, a wrap-around deck with built in tic-tac-toe panel. A two step entry leads to the raised 54" slide platform. Built with Woodguard maintenance free lumber,10 year limited lumber warranty. Slide Deck Height - 54"
Slide - 9' - weight limit 250 lbs. Low Maintenance- unlike regular wood, Woodguard™ polymer coated lumber products never need painting, sanding, sealing or staining… stays looking great year after year! Strength of Wood… our product has a solid wood core thus providing a product that is 100% structural... no reinforcements needed for support. Great for use in fences, play sets, deck framing, patio covers etc. Durability of Plastic… our proprietary Polyethylene coating protects the lumber so there is No chipping, cracking or peeling plus U.V. stabilized- will not fade in sunlight. 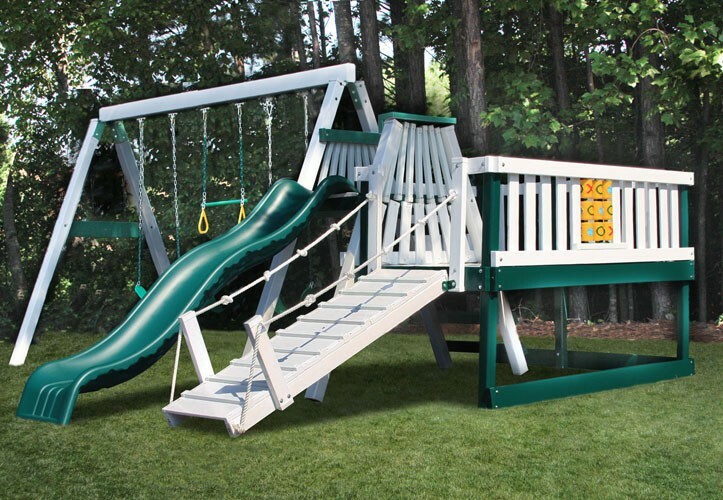 Congo Playsystems are custom made to order and arrive at your home completely "packaged" and ready to assemble. It is recommended for the assembly of this swing set that you have an adult helper to assist you. Building this swing set takes two adults working together. Owners manual with step by step instructions is included. Delivery is residential curbside delivery-a person(s) must be present to sign and help unload the item off the truck.